This article is about the university building in Paris, France. For other uses, see Sorbonne (disambiguation). The Sorbonne (UK: /sɔːrˈbɒn/, also US: /sɔːrˈbɔːn/, French: [sɔʁbɔn]) is a building in the Latin Quarter of Paris which was the historical house of the former University of Paris. 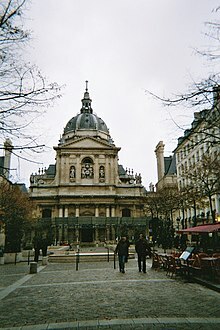 Today, it houses part or all of several higher education and research institutions such as Panthéon-Sorbonne University, Sorbonne Nouvelle University, Paris Descartes University, École pratique des hautes études, and Sorbonne University. The name is derived from the Collège de Sorbonne, founded in 1257 by the eponymous Robert de Sorbon as one of the first significant colleges of the medieval University of Paris. The library was among the first to arrange items alphabetically according to title. The university predates the college by about a century, and minor colleges had been founded already during the late 12th century. 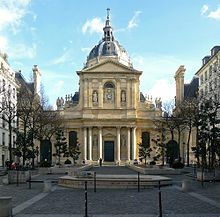 During the 16th century, the Sorbonne became involved with the intellectual struggle between Catholics and Protestants. The University served as a major stronghold of Catholic conservative attitudes and, as such, conducted a struggle against King Francis I's policy of relative tolerance towards the French Protestants, except for a brief period during 1533 when the University was placed under Protestant control. The Collège de Sorbonne was suppressed during the French Revolution, reopened by Napoleon in 1808 and finally closed in 1882. This was only one of the many colleges of the University of Paris that existed until the French revolution. Hastings Rashdall, in The Universities of Europe in the Middle Ages (1895), which is still a standard reference on the topic, lists some 70 colleges of the university from the Middle Ages alone; some of these were short-lived and disappeared already before the end of the medieval period, but others were founded during the early modern period, like the Collège des Quatre-Nations. With time, the college came to be the main French institution for theological studies and "Sorbonne" was frequently used as a synonym for the Paris Faculty of Theology despite being only one of many colleges of the university. After months of conflicts between students and authorities at the University of Paris at Nanterre, the administration closed that university on May 2, 1968. Students at the Sorbonne campus in Paris met on May 3 to protest against the closure and the threatened expulsion of several students at Nanterre. On May 6, the national student union, the Union Nationale des Étudiants de France (UNEF) — still the largest student union in France today — and the union of university teachers called a march to protest against the police invasion of Sorbonne. More than 20,000 students, teachers and other supporters marched towards the Sorbonne, still sealed off by the police, who charged, wielding their batons, as soon as the marchers approached. While the crowd dispersed, some began to make barricades out of whatever was at hand, while others threw paving stones, forcing the police to retreat for a time. The police then responded with tear gas and charged the crowd again. Hundreds of students were arrested. May 10 marked the "Night of Barricades," where students used cars, wood, and cobblestones to barricade the streets of the Latin Quarter. Brutal street fighting ensued between students and riot police, most notably on Rue Gay-Lussac. Early the next morning, as the fighting disbanded, Daniel Cohn-Bendit sent out a radio broadcast calling for a general strike. On Monday, 13 May, more than one million workers went on strike and the students declared that the Sorbonne was "open to the public". Negotiations ended, and students returned to their campuses after a false report that the government had agreed to reopen them, only to discover police still occupying the schools. When the Sorbonne reopened, students occupied it and declared it an autonomous "People's University". During the weeks that followed, approximately 401 popular action committees were established in Paris and elsewhere to document grievances against the government and French society, including the Occupation Committee of the Sorbonne. In 1970, the University of Paris was divided into thirteen universities, managed by a common rectorate, the Chancellerie des Universités de Paris, with offices in the Sorbonne. Three of those universities maintain facilities in the historical building of the Sorbonne, and thus have the word in their name: Panthéon-Sorbonne University, Sorbonne Nouvelle University and Paris-Sorbonne University. Paris Descartes University uses also the Sorbonne building. The building also houses the École Nationale des Chartes, the École pratique des hautes études, the Cours de Civilisation Française de la Sorbonne and the Bibliothèque de la Sorbonne. The Sorbonne Chapel was classified as a French historic monument in 1887. The amphitheatre (Le Grand Amphithéâtre) and the entire building complex (façades and roofs) became monuments in 1975. ^ "Sorbonne". Oxford Dictionaries. Oxford University Press. Retrieved 30 December 2018. ^ "Sorbonne definition and meaning | Collins English Dictionary". Retrieved 30 December 2018. ^ English Literature - William Henry Schofield. BiblioLife. 31 January 2009. Retrieved 16 February 2012. ^ Murray, Stuart A. P.. The Library : An Illustrated History, Skyhorse Publishing, 2009, (Print) ISBN 9781602397064. ^ Paris: May 1968. Solidarity pamphlet series no. 30 (Bromley [Kent]), 1968). ^ "Monuments historiques: Sorbonne (La)" (in French). Merimee Database, French Ministry of Culture. 13 October 2015. Wikimedia Commons has media related to La Sorbonne.